Find out what our experts have to say about Yamaha FZ-F1! Choose the Yamaha FZ-F1 which fits your bill! Choose the Yamaha FZ-F1 which fits the bill of you. Yamaha entered the 150cc Indian motorcycle market with a bang by launching the FZ series back in 2008. 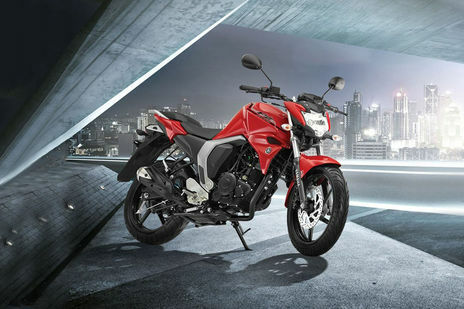 Instantly, it became very popular among the bike lovers across India because of its muscular, sporty looks and an affordable price tag in the 150cc category. The FZ series is by far the most popular and successful bike series by Yamaha. The Japanese bikemaker upgraded the FZ and introduced version 2.0 of the FZ FI, featuring the Fuel-Injection system in 2014. The latest version featured a downsized engine, 149cc, but the efficiency had increased by 14 percent as per Yamaha’s claims. The Yamaha FZ FI features a sharp headlamp, sculpted fuel tank, beefy muffler, split seats, and an all-digital instrument console. Currently, the FZ FI is offered in a single variant which is priced at Rs 81,500 (ex-showroom, Delhi) and is offered in two colour schemes - Bomber Black and Barrell Red. It’s been quite some time now that the FZ FI has received any updates and we can expect an updated model of the FZ very soon. Recently, two new generation FZ FI mules were spied testing under heavy camouflage near Chennai. Based on first looks, it's apparent that the FZ FI will receive a host of technical and cosmetic updates. It’s expected that Yamaha will launch the updated model in the first quarter of 2019. The Honda CB Hornet 160R, the Bajaj Pulsar NS 160 and the TVS Apache RTR 160 4V are the most notable competitors of the Yamaha FZ FI. The FZ FI looks sporty and muscular. The second version of the bike is more angular and sleek. Yamaha has designed the FZ FI with minimum graphics and decals, yet the bike looks very attractive. At the front, it features a multi-reflector headlight, sleek turn indicators, and a wide handlebar. The beefy, 12-litre fuel tank gets a triple macho design with an FZ FI decal to add to its aggressive styling. It comes fitted with a skid-free, stepped-up, split seat and a newly designed midship muffler to add sportiness to the bike. The rear features a sleek LED tail lamp and turn indicators along with a split aluminium grab rail. The two colour schemes - Bomber Black and Barrell Red look very enticing and add to the charm of the FZ FI. It features a fully digital instrument console with readouts like tripmeter, speedometer, odometer, and tachometer. At the heart of the FZ FI is a 149cc, single cylinder, 4-Stroke, 2-Valve, SOHC, Blue Core engine which features a Fuel Injection system. The motor produces 13.2PS of max power at 8,000rpm and a peak torque of 12.8Nm at 6,000rpm. Power is transmitted to the rear wheel using a 5-speed constant mesh transmission. Yamaha claims that the efficiency of the engine has increased by 14 percent in comparison to the previous carburetor model. It comes fitted with a wet, multiple-disc clutch to facilitate smooth gear shift. It can reach a top speed of 112kmph and returns a mileage of 45kmpl, as per the company claims. The Yamaha FZ FI version 2.0 is fitted with a front disc brake and a rear drum brake. The FZ FI misses out on ABS. It is built on a diamond frame and the skid-free split seat adds to the rider's comfort while driving. Suspension setup consists of telescopic front forks and a 7-step adjustable Monocross unit at the rear. It rides on 17-inch alloy wheels shod with chunky tubeless tyres, 140/60 at the front and 100/80 at the rear, which provide a good on-road grip. The ride quality of the bike is very pleasant both in city traffic and on the highways. One of the biggest drawbacks at the safety front is lack of ABS on the FZ FI. There is no option of a rear disc brake as well, which again raises safety concerns. That said, news of an updated model is already doing rounds of the internet, and with the government’s mandate on ABS, the 2019 model will certainly be equipped with the ABS.